The Regulation of Hazardous Substances in the U.S. The opinions expressed in this piece are the author's and do not necessarily represent those of Product Safety Forum. Product Safety Forum is a free service of Product Safety Letter. Its mission is twofold: to promote frank and open airing of product safety issues and to provide advice and guidance from top experts in the field. Do you have an idea or article you think would make a great piece for Product Safety Forum, including commentary or reaction to this one? Then email Publisher Sean Oberle to discuss it. Several federal agencies regulate substances and materials in consumer, commercial, and industrial chemical products. Depending on the federal statute and the regulatory scheme, controlled and banned chemical substances are governed by multiple key regulations that identify individual hazardous substances or the product into which its ingredients are placed. Federal agencies also control chemicals by requiring labeling or testing of chemical substances and specific products before they enter the marketplace or are used in the workplace. This paper identifies the federal authorities and accompanying statutes and regulations that govern their chemical products. 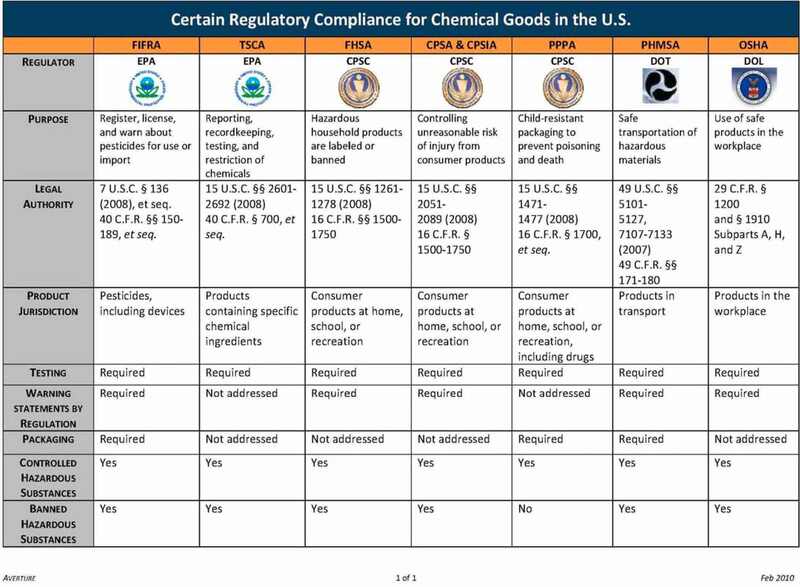 The following Acts and regulations, to varying degrees, most commonly regulate chemical substances: the Federal Insecticide, Fungicide, and Rodenticide Act (FIFRA) and Toxic Substances Control Act (TSCA), both of which are administered by the Environmental Protection Agency (EPA); the Consumer Product Safety Act (CPSA) and Consumer Product Safety Improvement Act (CPSIA), the Federal Hazardous Substances Act (FHSA), and the Poison Prevention Packaging Act of 1970 (PPPA), all of which are administered by the Consumer Product Safety Commission (CPSC); the Pipeline and Hazardous Materials Safety Administration (PHMSA) regulations; and the Occupational Safety and Health Administration (OSHA) regulations. Much overlap exists among these various laws. The key to compliance is understanding the product and ingredient jurisdiction given each federal agency that administers these laws. This paper is a first look at how the makers of chemical goods can efficiently accomplish compliance across multiple regulatory bodies. See the How to Comply sections within each of the Key Regulations below. (1) Federal Insecticide, Fungicide, and Rodenticide Act—FIFRA. FIFRA controls chemical substances in the form of active ingredients in pesticide products1. FIFRA broadly applies to any producer, defined as any person “who produces any pesticide, active ingredient, or device (including packaging, repacking, labeling, and relabeling). 2 Determining whether a product is a pesticide is a first step in discerning whether the product is required to be registered under FIFRA. Pesticide is defined as, “any substance or mixture of substances intended for preventing, destroying, repelling, or mitigating any pest, or intended for use as a plant regulator, defoliant, or desiccant.3 If the chemical product meets this broad definition, the next step in determining whether a product is a pesticide is to consider intent (i.e., whether the product is intended for a pesticidal purpose).4 The regulations set forth criteria to determine if the required intent is established, including: whether there are claims or representations the product be used as a pesticide; whether the substance consists of active ingredients that have no other commercial purpose than as a pesticide; and whether the person who distributes or sells the substance has knowledge that the substance will be used for a pesticidal purpose.5 If any of these regulatory criteria are met, the manufacturer or processor can conclude that the product is a pesticide and is thus subject to the registration and labeling requirements. Additionally, FIFRA-controlled chemical substances require product labeling, an ingredient statement, use classification, precautionary labeling (warnings to consumers), work protection labeling, directions for use, labeling claims, storage and disposal instructions, identification numbers, company name and address data, graphic symbols on the product label, and content and net weight statements. 6 These federal requirements tightly control FIFRA substances and their labeling. How to Comply. Chemical manufacturers can comply with FIFRA requirements by identifying those substances that are regulated by the Act. Only chemical companies manufacturing or selling pesticide, rodenticide, or fungicides must comply with the accompanying regulations, or establishments that import those materials into the United States. These substances are not controlled by any other Act. Once a product is identified as a pesticide, rodenticide, or fungicide within the Act’s definition, a chemical manufacturer must ensure that the product is properly registered and licensed with the EPA and that the product’s labeling contains the detailed warnings that are tightly controlled by EPA regulations. Currently, only active ingredients must be identified on the product label with its percentage by weight, but the EPA is seeking to regulate inactive or inert ingredients by requiring disclosure on the label. The EPA has broad regulatory authority under TSCA to require labeling both for existing chemicals and for new chemicals on a case-by-case basis.13 At present, product labeling under TSCA is only required for asbestos, PCBs, hexavalent chromium, and acrylamide grout.14 The complete list of chemicals regulated through other means such as reporting, recordkeeping, and testing include: polychlorinated biphenyls (PCBs), asbestos, radon, lead-based paint, hexavalent chromium, acrylamide grout, phthalates, benzidine dyes, Bisphenol A (BPA), perfluorinated chemicals (PFCs), polybrominted diphenyl ethers (PBDEs), chlorinated parrafins, lead, mercury, formaldehyde, glymes, carbon nanotubes, and dibenzo-para-dioxins/dibenzofurans.15 Currently, there are no banned chemical substances under TSCA. How to Comply. The TSCA governs industrial chemical substances. Only manufacturers and processors of commercial industrial products must comply with the health and environmental testing and recordkeeping required under the Act’s regulations, as household products containing hazardous ingredients are governed by the FHSA. A manufacturer must also ensure that their products are properly labeled if they are intended for commercial distribution and contain one of the following: asbestos, PCBs, hexavalent chromium, and acrylamide grout. With the TSCA in particular, chemical companies must stay abreast of new legislative reforms to the TSCA, and the new expanded authority given to the EPA over certain chemical substances. (4) Consumer Product Safety Act—CPSA. The CPSA designates jurisdiction of the Consumer Product Safety Commission (CPSC) over “consumer products” only. Consumer products are defined as “any article, or component part thereof, produced or distributed (i) for sale to a consumer for use in or around a permanent or temporary household or residence, a school, in recreation or otherwise, or (ii) for personal use, consumption or enjoyment of a consumer in or around a permanent or temporary household or residence, a school, in recreation, or otherwise.25 The CPSA applies to manufacturers, retailers, and private labelers of consumer products.26 The more recent Consumer Product Safety Improvement Act of 2008 (“CPSIA”) broadly updated the existing CPSA on many levels, including the control of allowable thresholds for lead and phthalates. How to Comply. Only chemical manufacturers of consumer products must comply with the CPSA and the CPSIA. The CPSA itself does not provide specific labeling requirements for chemical goods, with the exception of certain lead paint notifications and with regard to children’s toys, games, small parts, and child care articles. However, the CPSA regulations address labeling requirements for hazardous substances under the authority of the FSHA, also administered by the CPSC. Therefore, a chemical company must reference the FHSA’s labeling requirements if the product is hazardous as determined by the testing requirements under FHSA. Also, a chemical goods company that manufacturers or produces a consumer product that falls under CPSIA’s authority must understand when a GCC is required under the CPSIA, what must be included in the certification, how the certification may be distributed, and understand the consequences for failure to certify. In making this determination, a manufacturer should consult CPSIA regulations and guidance materials, as well as keep abreast of current industry trends regarding the issuance of a GCC. How to Comply. The PPPA directs its requirements to a manufacturer and packager of a chemical good, but provides no definition of either entity. Thus, it is recommended that a chemical goods company comply if they manufacture or handle chemical products that are to be distributed to households and that meets any definition of “hazardous” under the FHSA, or specifically enumerated in the list supra. Once it is determined that special packaging is required under the PPPA, the packaging must first be tested according to the regulations and then provided to the CPSC in the sizes and with the labeling to be used before it enters the marketplace.41 The CPSC provides detailed guidance about the compliance requirements for the PPPA. (6) Pipeline and Hazardous Materials Safety Administration—the PHMSA regulations (“HazMat”). The Federal hazardous materials transportation law (Federal hazmat law) is governed by rules and regulations issued by the Pipeline and Hazardous Materials Safety Administration (PHMSA) within the DOT. These regulations protect against the risks to life, property, and the environment inherent in the transportation of hazardous materials in intrastate, interstate, and foreign commerce.42 Under its authority to enforce Federal hazmat law, PHMSA’s regulatory functions include issuing Hazardous Materials Regulations (HMR) that govern the safe transportation of hazardous materials by aircraft, railcar, vessel, and motor vehicle.43 HMRs cover: (1) hazardous materials classification; (2) packaging requirements; (3) hazard communication; (4) operational rules; (5) training and security; and (6) registration. How to Comply. A chemical goods manufacturer need only comply with federal Hazmat law if they offer quantities of hazardous materials for transport or if they participate in the manufacture or testing of packaging containers for those hazardous materials. Also, only certain hazardous materials are covered by the HMR. Thus, some chemical goods company may not be subject to PHMSA regulations if they typically manufacture household products or industrial products containing chemical substances that do not meet the specific requirements as defined by PHMSA regulations. However, if a chemical goods company falls under PHSMA regulation because of their specific functions or because they offer goods for transport in that meet reportable quantities, they must ensure that each package and label are designed for the specific hazardous material being transported. Additional regulatory requirements too detailed to mention here may be found within the PHMSA. (7) Occupational Health and Safety Administration—the OSHA regulations. OSHA regulations, promulgated under the authority of the Occupational Safety and Health Act of 1970 (OSH Act),50 broadly cover industry and the protection of industry’s employees from hazardous materials and substances.51 Generally, certain hazardous substances and materials under OSHA’s control are regulated through precautionary labeling, packaging requirements, and employee training. Currently, OSHA regulates exposure to 400 substances discussed in Appendix B attached hereto. 52 OSHA’s Chemical Sampling Information (CSI) file contains listings for approximately 1,500 hazardous substances that also fall within OSHA’s scope of authority. Specific hazardous materials also controlled by OSHA include: compressed gases; acetylene; hydrogen; oxygen; flammable and combustible liquids, including aerosols, and spray finishing using flammable and combustible materials. No chemical substances or materials are banned by OSHA. Lastly, chemical manufacturers need to be aware that twenty-four states have their own OSHA-approved state plans, standards, and enforcement policies.53 For the most part, these states have adopted standards that are identical to Federal OSHA, but some states have adopted different standards and enforcement policies of which chemical manufacturers must abide by for chemical substances in the workplace. How to Comply. Chemical manufacturers must comply with OSHA regulations for chemicals found in their workplaces, or provided to the workplace, as the purpose of OSHA is to protect employees working with hazardous substances. Certain hazardous materials and substances are under OSHA’s control and are individually identified by OSHA regulations. Generally, companies must ensure that labeling, packaging requirements, and employee training for working with hazardous substances found in the workplace as called out by OSHA regulations are met to protect their employees from occupational exposure. OSHA is updating its regulatory requirements for MSDS documents, symbols, and language under the new Global Harmonization System of classification and Labeling (GHS) approved by the U.N.
Patricia Hietter and Mark Kinzie are lawyers at Averture. You can reach them at patricia.hietter@averture.net or mark.kinzie@averture.net or via telephone at 314.862.7878. 1Federal Insecticide, Fungicide, and Rodenticide Act, 7 U.S.C. § 136. Inactive ingredients in pesticide products are currently being considered for regulation. 6Refer to the EPA Label Review Manual and FIFRA regulations at 40 C.F.R. §§ 150-189 to obtain specific guidance. 715 U.S.C. § 2601 et seq. 12Commercial purpose is defined as, “to import, produce or manufacture with the purpose of obtaining an immediate or eventual commercial advantage for the manufacturer or importer, and includes, among other things, ‘manufacture’ or any amount of a chemical substance or mixture: (1) for commercial distribution, including for test marketing, or (2) for use by the manufacturer, including use for product research and development or as an intermediate. 40 C.F.R. § 710.2; 40 C.F.R. § 720.3. 14Refer TSCA regulations at 16 C.F.R. §§ 1301-1305 to obtain specific guidance regarding product labeling. 15Refer TSCA regulations at 16 C.F.R. §§ 1301-1305 to obtain specific guidance regarding requirements for these chemicals. 16Chemicals currently on the “chemicals of concern” list include:, phthalates, hexabromocyclododecane (HBCD), nonylphenol and nonylphenol ethoxylates, long-chain perfluorinated chemicals (PFCs), polybrominated diphenyl ethers (PBDEs) in products, short-chain chlorinated paraffins, Benzindine dyes and pigments, and Bisphenol A (BPA). Diisocyanates and siloxanes are in the action plan development process. 17The Federal Hazardous Substances Act, 15 U.S.C. §§ 1261-1278. 19Refer FHSA regulations at 16 C.F.R. §§ 1500.40-1500.46 to obtain specific guidance. 20U.S. Consumer Product Safety Commission: Office of Compliance, Requirements Under the Federal Hazardous Substances Act: Labeling and Banning Requirements for Chemicals and Other Hazardous Substances (August 2002). 23U.S. Consumer Product Safety Commission: Office of Compliance, Requirements Under the Federal Hazardous Substances Act: Labeling and Banning Requirements for Chemicals and Other Hazardous Substances (August 2002). 24U.S. Consumer Product Safety Commission: Office of Compliance, Requirements Under the Federal Hazardous Substances Act: Labeling and Banning Requirements for Chemicals and Other Hazardous Substances (August 2002). 26Consumer Product Safety Act, 15 U.S.C. §§ 2051-2089. 34The Consumer Product Safety Improvement Act of 2008. 3515 U.S.C. §2063(a)(1). Please refer to 74 FR 68328, 68330 (2008) for specific information regarding CPSC GCC requirements. 39Refer to 16 C.F.R. § 1700.20 for specific guidance regarding testing procedures for special packaging. 4116 C.F.R. § 1700.14(b); 16 C.F.R. §1700.20. 4249 U.S.C. § 5101 et seq. 43See, 49 C.F.R. §§ 171-180. 48Refer to 49 C.F.R. § 173.24 for specific guidance regarding for special packaging required by Hazmat regulations. 49Refer to 49 C.F.R. § 172 for specific guidance regarding special hazardous communication requirements, including labeling, for hazardous packages. 5029 U.S.C. § 651 et seq. 5129 C.F.R. §§ 1910.101-119, 29 C.F.R. §§ 1910.1003-1096. 52See, 29 C.F.R. § 1910, Subpart Z. 53Alaska, Arizona, California, Connecticut, Hawaii, Illinois, Indiana, Iowa, Kentucky, Maryland, Michigan, Minnesota, Nevada, New Jersey, New Mexico, New York, North Carolina, Oregon, Puerto Rico, South Carolina, Tennessee, Utah, Vermont, Virgin Islands, Virginia, Washington, and Wyoming. The Connecticut, Illinois, New Jersey, New York and Virgin Islands plans cover public sector employment only.